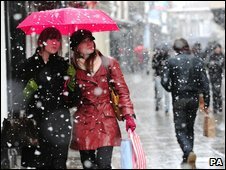 Disruption caused by the heavy snowfall could cost UK businesses about £1bn, business groups have estimated. The Federation of Small Businesses (FSB) estimated 20% of the UK's working population, or 6.4 million people, did not make it to work. South-east England had the worst snow it has seen for 18 years, causing all London buses to be pulled from service and the closure of Heathrow's runways. Trading on the London Stock Exchange was also thinner than normal. Stephen Alambritis from the FSB said its estimate of £1.2bn was a cautious one and the actual cost was likely to be higher. "There is also the knock-on effect of passing trade going down as people won't be buying their sandwiches for lunch or picking up a coffee or newspaper," he said. Royal Mail collections and deliveries have also been disrupted. Questions have been asked about whether authorities were sufficiently prepared for the snowfall, given that it was widely forecast. Q&A: Can the boss dock my pay? Derek Turner, national traffic director at the Highways Agency said that gritters and snow ploughs had been out in force and put the slow-moving traffic down to jack-knifed lorries and other accidents. "Roads are now clear of snow by and large. The issue is that drivers aren't used to these conditions," he said. Earlier on Monday, all London bus services were cancelled for the first time and there were delays on many rail and underground lines. 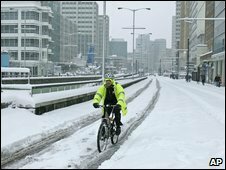 The Mayor of London, Boris Johnson, admitted that the capital was not equipped to deal with such an unusually heavy snow fall. "This is the kind of snow we haven't seen in London in decades. We don't have the snow-ploughs that we would otherwise need to be sure of getting the roads free," he said. "The difficulty really has been that the volume of snow has been so huge that you can put down the grit, put down the salt, but then it simply snows over it again and you run the risk of unleashing a 12-tonne bus on to heavily-packed snow or ice and turning it into a lethal weapon." But Mr Johnson said it did not necessarily make sense to make a major investment in snow-ploughs if they were only used once every two decades. This view was shared by Professor David Begg, a former government transport adviser. He said buses and trains could be equipped with snow-ploughs, but he was not convinced that the "economic case stacked up". He said it was more important for authorities to allow bus, train and gritter lorry drivers to stay in bed and breakfasts overnight so they could be at work early in the morning. Companies should also make it easier for staff to work from home, he added. "Britain's relatively mild climate means we don't have enough incidents like the past 24 hours to justify the kind of investment that Scandinavian and Eastern European countries have made," he said. The Centre for Economic and Business Research said that UK economic output or gross domestic product per day was about £4.5bn. "So if 20% of the population have zero productivity for the day, there is a loss of £900m," said Douglas McWilliams, the CEBR's chief executive. He added that companies' cashflow could be hit by delayed payments as a result of the disruption and this could mean that an additional 2,000 to 3,000 businesses may fail as a result of the bad weather. "Many of the businesses that are close to failing are in the retail and construction sectors that are likely to be most affect by the snow and transport disruption," he said. Dr Helen Hill, director of policy and public affairs at the London Chamber of Commerce and Industry said that a one-day closure of the tube could cost the capital £48m in lost productivity. "Hopefully things will not grind to a halt completely however, as local staff may be able to get into the office and many others can now work remotely and conduct business online," she said. Howard Archer, an economist at research firm Global Insight, said that small businesses could be particularly vulnerable if core staff cannot make it to work. However, he said that any hit to the economy was likely be short-lived. "Some of the loss of business/trading may be quickly made up once the bad weather eases. Very cold weather will boost utilities output," Mr Archer said. "But any disruption to business is the very last thing that the UK economy needs in its current extremely weak state," he added. Keith Tilley, managing director of SunGard, which helps companies to deal with unexpected events, said its clients had so far not faced too much disruption. "Employers need to do everything they can to allow staff to work from home and ensure that those that do manage to travel to work are well looked after, with overnight accommodation if necessary," he said. "Businesses need to do all they can to maintain normal service levels and ultimately avoid losing customers and revenue," he added.